When a mysterious fire ravages the town of Donkleywood, causing the death of her beloved grandfather Nickolas, eleven-year-old Holly O’Flanigan, numb with grief, loses all hope of ever becoming a famous artist like him or of escaping her abusive foster family, the Smoralls. While hiding from them, Holly discovers a secret attic where her grandfather left a decidedly unusual paintbrush and a canvas with the image of a fantasy world—one Holly and three friends literally fall into. 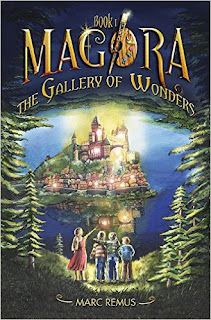 The painting is a gateway to the parallel world of Magora, where everything and everyone are created by painting. 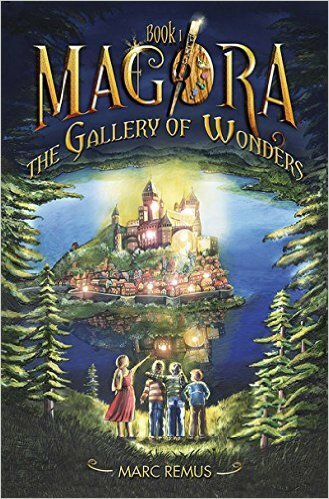 With her three sidekicks in tow, Holly enrolls in the exciting Cliffony Art Academy, where they learn to weave painting with magic, just as Grandfather Nickolas could. Her hopes of becoming a painter and escaping the Smoralls finally seem to be coming true. Meanwhile, valuable artwork is being stolen from the Gallery of Wonders. As these paintings could provide a portal back to the real world, Holly begins a search for the thief. She believes that the dark Duke of Cuspidor might be the culprit and that he has a spy among the instructors of Cliffony.But Holly’s self-doubt keeps her from making any progress in school, and she struggles to learn the brushstrokes she needs so urgently. They not only bring objects, people, and animals to life, they’re also Holly’s best defense against the dangerous Unfinished—monstrous beings created when an artist leaves a painting incomplete. Like vampires, the Unfinished hunger for the one thing that can flesh out their bodies—blood. And because Holly is a Gindar, an artist with the rare ability to create a brand new species, they want Holly’s blood most of all.